See also the posts about the project on the HASTAC digital humanities network (here and here), as well the full list of events in the Duke Digital Scholarship Services series this semester (here). 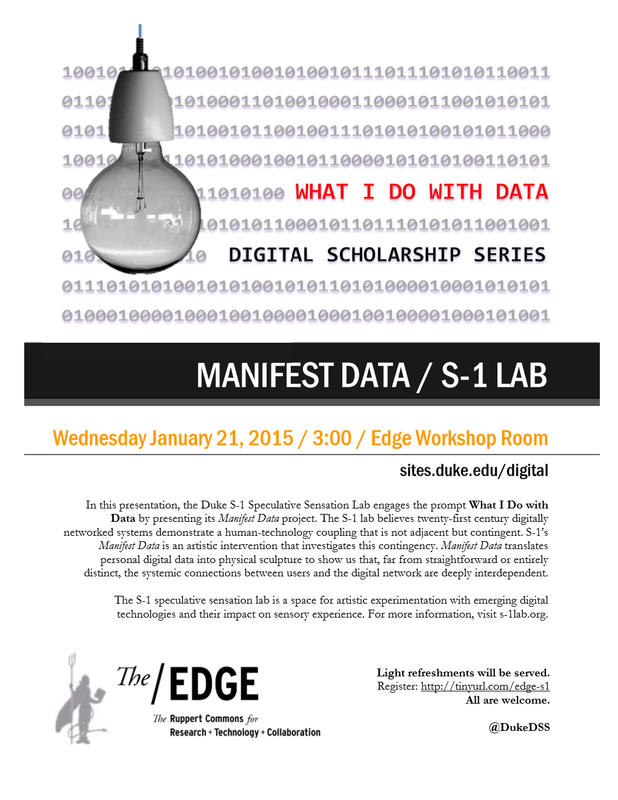 On January 30, 2015 (12:00-1:00pm), I will be speaking about visualization techniques and game-related serialization processes at the Duke Visualization Friday Forum. Organized by Eric Monson and Angela Zoss, this is a very exciting and robustly interdisciplinary venue, as the long list of sponsors for the weekly forum indicates: Information Science + Information Studies, the Duke immersive Virtual Environment (or DiVE), Media Arts + Sciences, Data and Visualization Services, the Department of Computer Science, Research Computing at the Office of Information Technology, and Visualization & Interactive Systems. As this list indicates, the Visualization Friday Forum has the potential to take just about anyone — but especially humanities-types like me — out of their comfort zone; but it does so in the most comfortable way possible: the informal setting of a lunchtime chat fosters a type of exchange that is interdisciplinary in the best sense. Artists, computer scientists, media scholars, digital humanists, historians, literary critics, mathematicians, and researchers in the natural sciences, among others, make a genuine effort to understand one another. And, to judge from the times I have been present or watched a live-stream of the Forum, this effort is usually quite successful. Seriality is a common feature of game franchises, with their various sequels, spin-offs, and other forms of continuation; such serialization informs social processes of community-building among fans, while it also takes place at much lower levels in the repetition and variation that characterizes a series of game levels, for example, or in the modularized and recycled code of game engines. 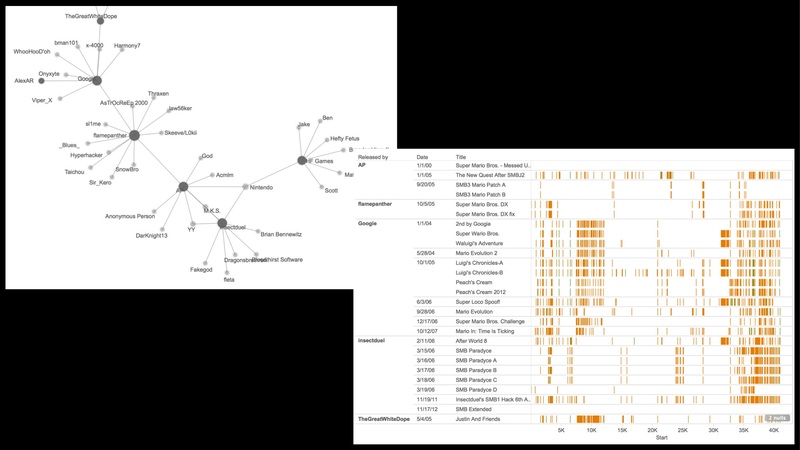 This presentation considers how tools and methods of digital humanities – including “distant reading” and visualization techniques – can shed light on serialization processes in digital games and gaming communities. The vibrant “modding” scene that has arisen around the classic Nintendo game Super Mario Bros. (1985) serves as a case study. Automated “reading” techniques allow us to survey a large collection of fan-based game modifications, while visualization software such as Tableau and Palladio help to bridge the gap between code and community, revealing otherwise invisible connections and patterns of seriality. I have written before about Karin Denson’s crazy hand-crafted garden gnomes, based on figures from popular culture, philosophy, and modern art (see here for a piece I posted about them last year). 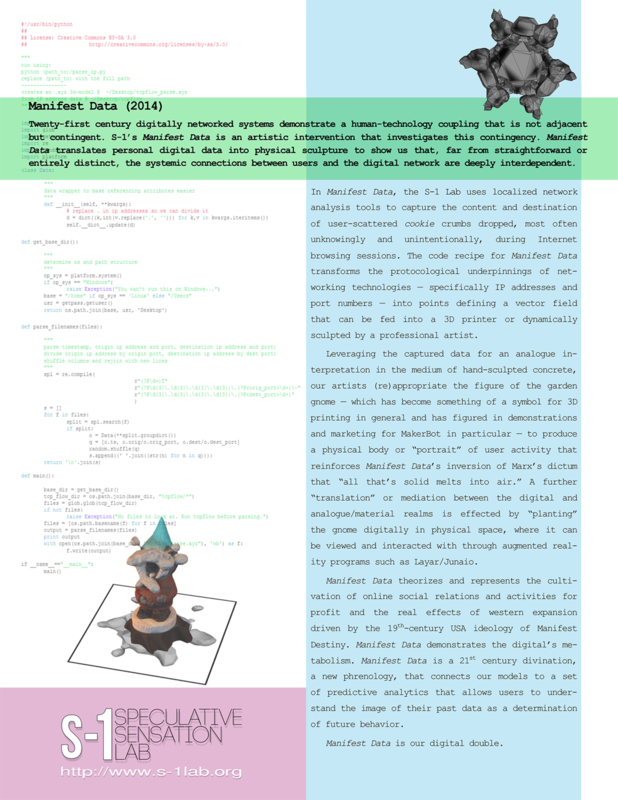 Recently, Karin’s gnomes have taken on new dimensions — quite literally, in fact — as she has transformed personal data collected during Internet browsing sessions into a sort of “portrait” of the user, subsequently turning this image of the interface into a gnome’s “data face,” and then subjecting the poor creature to a strict (but playful) regimen of photogrammetry, AR enhancement, and 3D printing. These new aspects, developed as part of the collaborative Manifest Data project, have further expanded the gnome’s artistic questioning of popular and high-art cultural formations, material and immaterial labor processes, class consciousness, national identity, and the role of seriality in all of them. It is only fitting, then, that as we prepare for next week’s presentation of Manifest Data, in which context Karin’s data gnomes mount a brave attempt to reverse the neo-cyber-Marxian dictum that “all that’s solid melts into zeroes and ones,” another of Karin’s gnomes is also currently on display: Karl Marx himself, or his gnomic Doppelgänger, is haunting the gallery, bringing things down to earth, and making them concrete (literally: solid concrete). 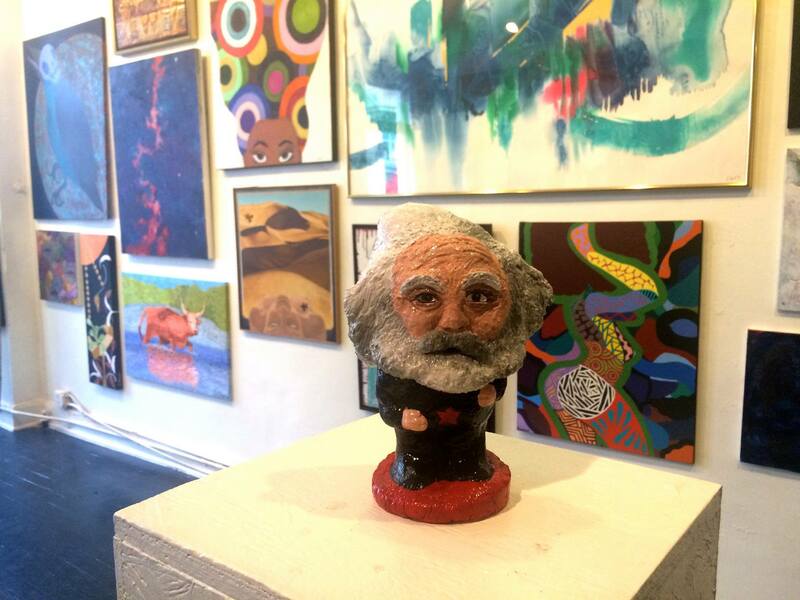 This week only, the Karl Marx gnome can be seen at The Carrack Modern Art, where he’s participating in a community show featuring 100 local artists from the Triangle area of North Carolina. The show runs today through Friday, 12-6pm, and Saturday 2-5pm. Also, as part of “Third Friday Durham,” there will be a reception with food, wine, and music this Friday, January 16, 2015, from 7-10pm. If you’re in or around Durham, don’t miss it! The Media and the Environment Scholarly Interest Group (MESIG) aims to provide a forum for shared discussion of research and pedagogy at the intersections of media and environment. 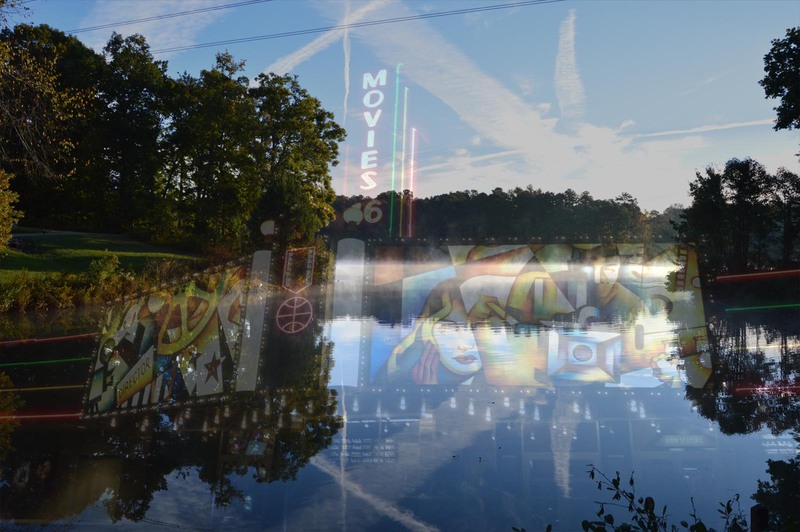 We believe that nearly every aspect of film and media practice and studies–from materials manufacturing and physical infrastructures, to filming locations and resources, to audiovisual aspects and themes, and beyond to marketing, preservation, obsolescence, and also scholarly discourse–touches matters of the environment and sustainability. Various approaches from an environmentalist perspective have been taken and more are still being developed to investigate how our mediated cultural practices have, do, and will position humans in relation to physical and natural worlds. How can we further film and media studies as a global–read planetary–concern, focused on dire changes and issues affecting the Earth and our natural surroundings? We believe our field has much to contribute to discussions and findings more frequently held in and attributed to science disciplines and Environmental Studies. With this Scholarly Interest Group, we seek to cultivate the study of significant matters of media and the environment within our field and through the representative collective that is SCMS. I am honored that our panel — which includes one explicitly environmental film/media theorist (Adrian Ivakhiv) but also three others (Steven Shaviro, Patricia Pisters, and Mark Hansen) who are helping to define the subject of post-cinema in broadly ecological terms — has been chosen for sponsorship by the Media and the Environment SIG, and I am grateful for their recognition of the topic’s relevance for our ongoing attempts to rethink the relations between humans, our media technologies, and the environments that we inhabit, access, and transform with and through them.